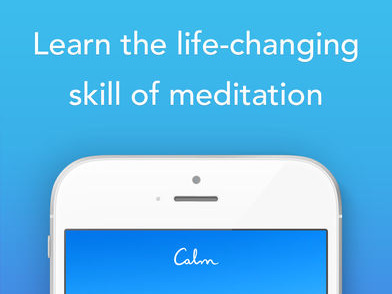 Calm, a meditation and relaxation aid, is now worth roughly $US250 million, according to CNBC. 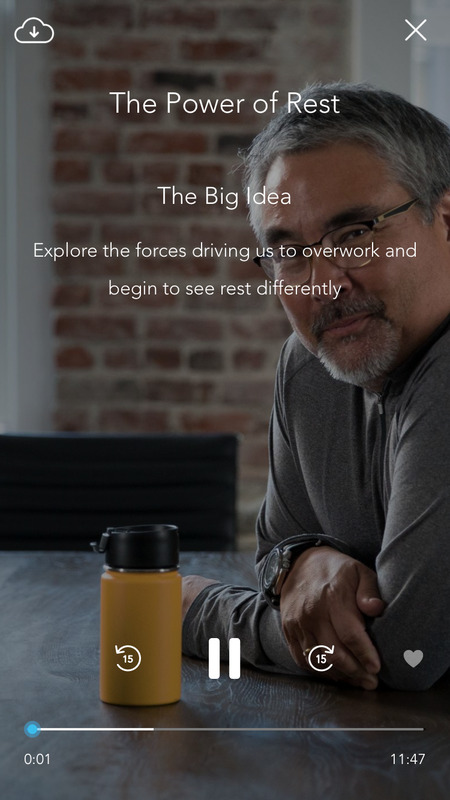 The San Francisco-based startup’s new valuation comes after Insight Venture Partners invested more than $US25 million into the company on Monday. Calm’s value now matches its closest competitor, Headspace, which also was valued at $US250 million as of January 2018. Calm, named the 2017 iPhone app of the year by Apple itself, promises to help users sleep better, boost confidence and reduce stress and anxiety, all with the help of guided meditations, soothing music, and bedtime stories. Just know in advance that while it’s free to download, it costs $US60/year after your 7-day free trial is up. 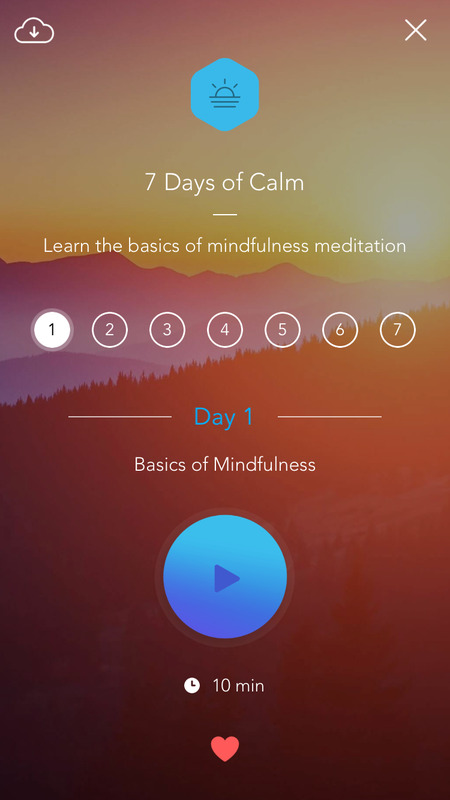 After you download Calm and sign up (or login via Facebook), opening the app for the first time will prompt you to choose the top goals you want to accomplish via meditation. Don’t worry, you can choose more than one! 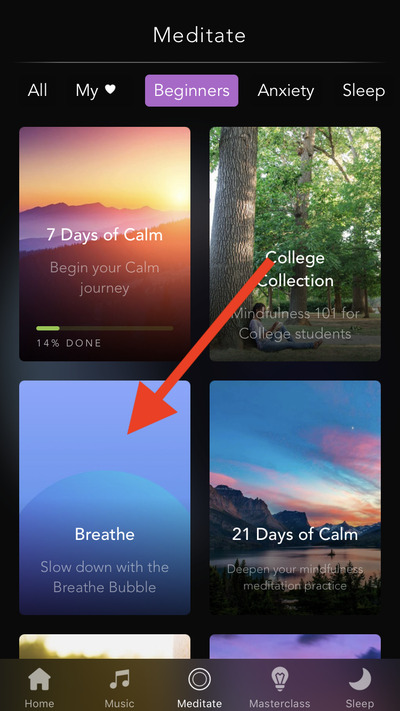 The home page offers helpful instructional bubbles. I suggest starting by personalizing your homepage’s background scene. 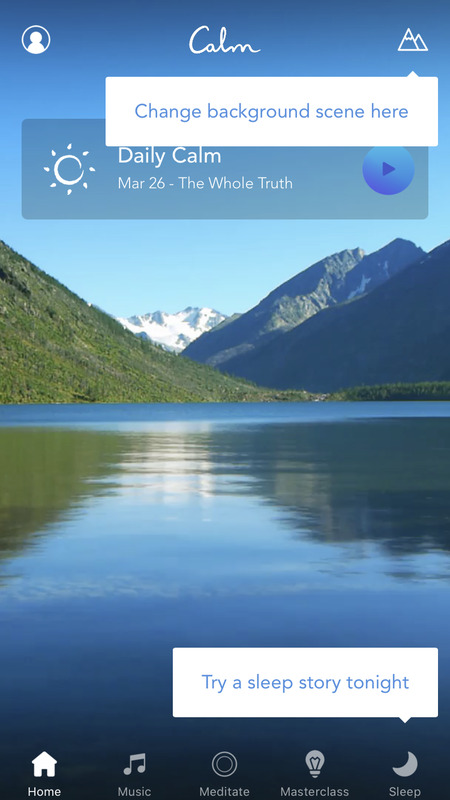 You can change your background scene by tapping the mountain icon in the top left corner of the home screen (as pictured above), or by simply swiping left and right on the image. There are many moving background scenes to choose from. All of them come with unique ambient, calming sounds that can also be turned off from this screen as well, if you so choose. 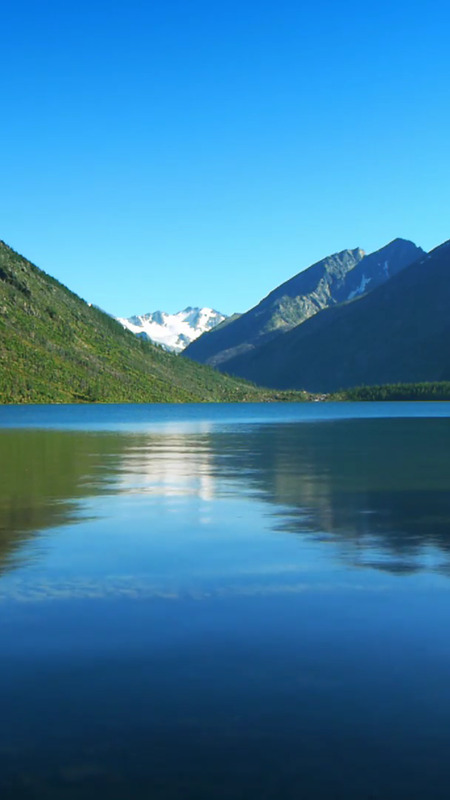 I’ll stick with my default mountainside lake, for now. 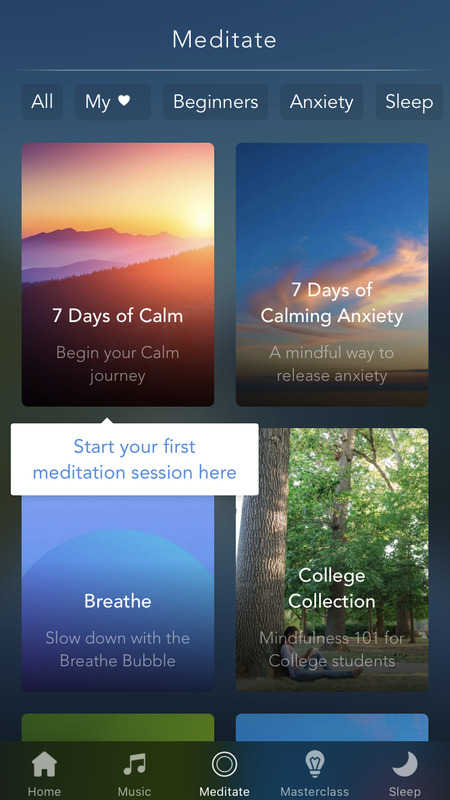 After you’ve chosen a soothing scene as your default, we’ll begin to explore the app’s main event: The Meditate tab. 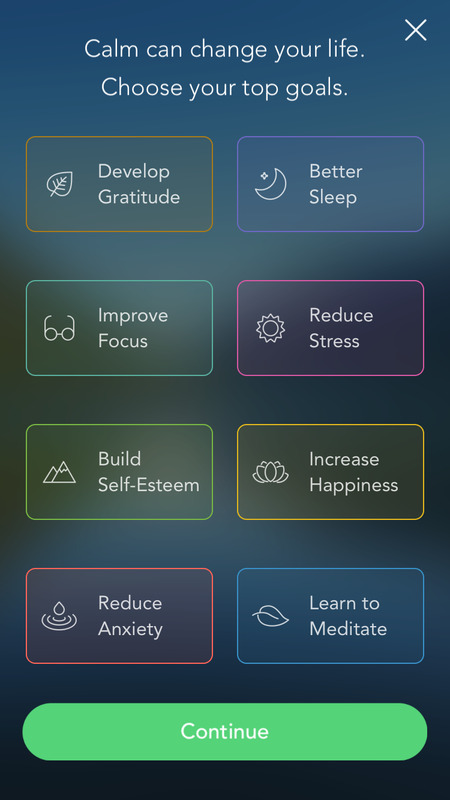 This menu will allow you to browse through hundreds of soothing podcasts that will guide you through various types of meditation, classified by different goals you’re hoping to achieve. The tabs at the top of the page indicate the different focuses of the various meditations, which range from 2 minutes to 35 minutes in length. This particular meditation series is meant to be an introduction to mindfulness and the very basics of meditating, so if you’ve never tried it before–on an app or otherwise–this is a great place to start. The gentle, female voice will prompt you to take deep breaths and clear your mind, all while your default ambient sound plays in the background. At the end of this ten minute session, she’ll remind you to return tomorrow for session two, and wish you a great day. 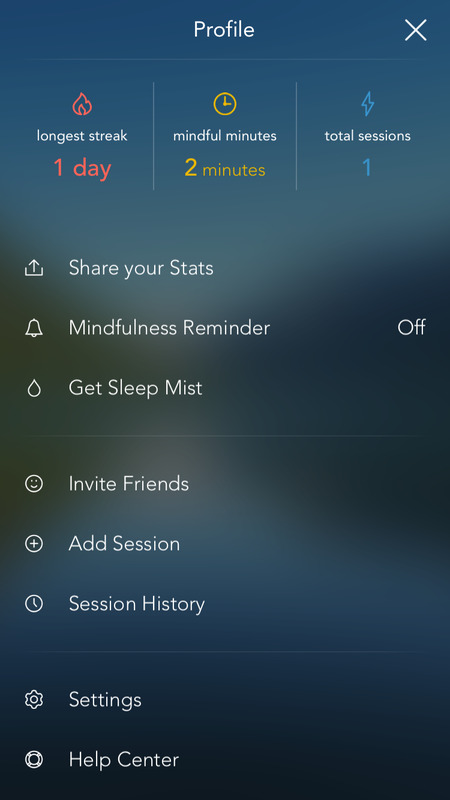 The meditation player looks a lot like Spotify. 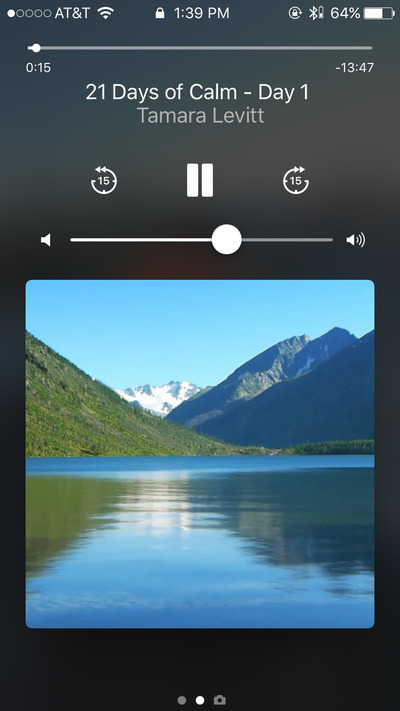 The pause and skip buttons are at the bottom, just above the progress bar. This button will allow you to change the volume of the ambient sounds that play when you visit the home screen, and during your meditations. When selected, a volume bar appears and all other controls are hidden. 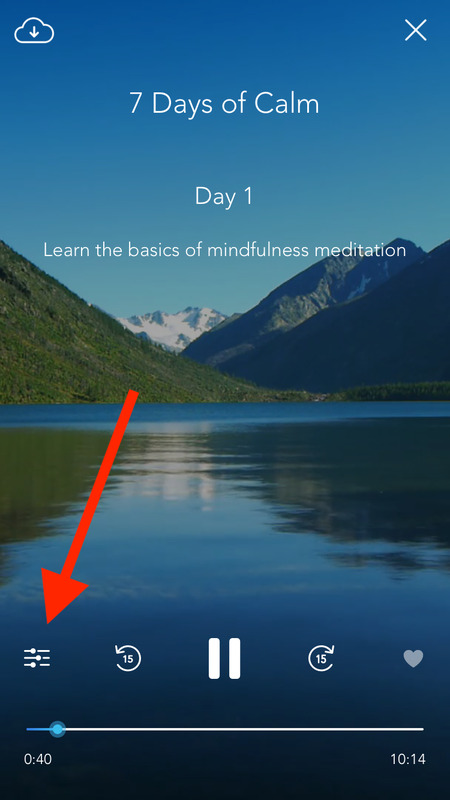 Be careful: It’s easy to confuse the volume bar and the progress bar, so make sure you don’t lose your place in the meditation. The heart button allows you to bookmark certain meditations, making them easier to find later. 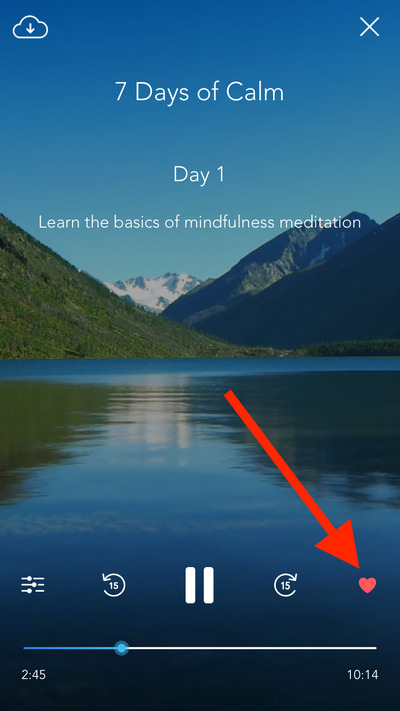 If you want to download your meditation for use without Wifi, you’ll click on this download button in the top left. While meditations are playing, if you don’t interact with the screen for a few seconds, the controls will disappear so you can better focus on the moving background. To bring back the controls, simply tap with one finger anywhere on the screen. If you lock your phone, or your screen goes into sleep mode, the meditation will continue to play, and you can pause or skip forward and backward from your lock screen. In the “Beginners” section of the meditations menu, you’ll find the “Breathe Bubble,” a very soothing and intuitive feature that helps the user slow down and steady their breathing. 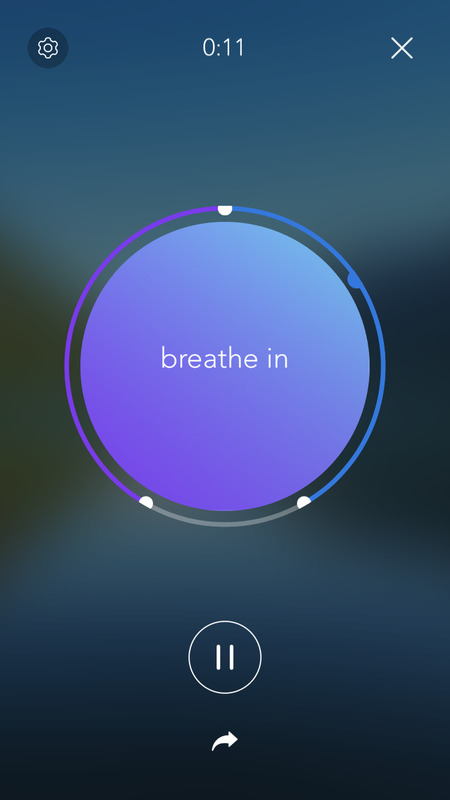 The feature uses customisable animations to guide the user through breathing exercises for a few minutes at a time. 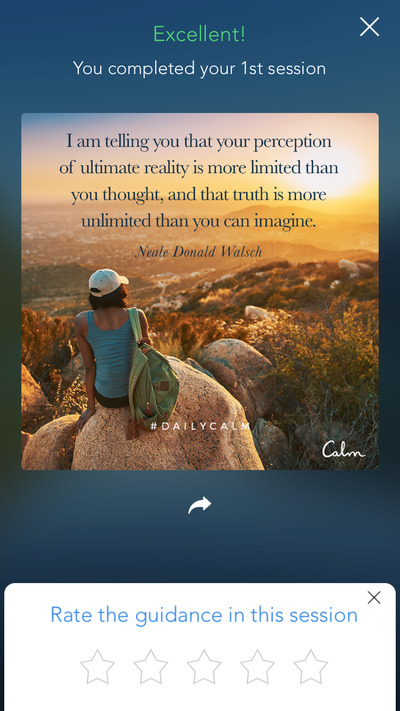 At the end of each meditation, you’ll be rewarded with a motivational poster of the day, and asked to rate the session. You’ll then be brought to your personal profile, to track your progress. 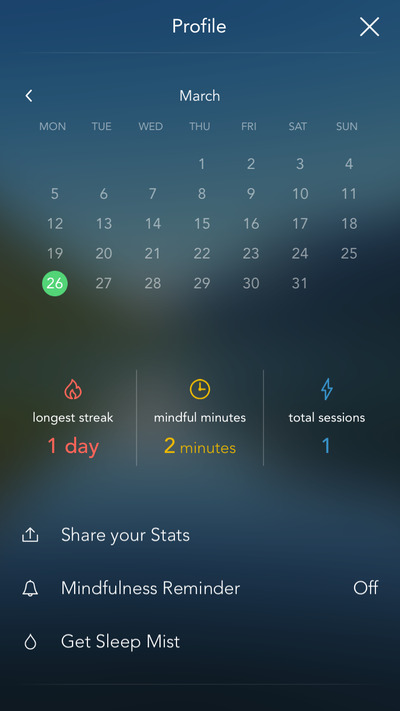 Here, you can see a record of the days that you’ve meditated, as well as your longest streak (days meditated in a row), the total number of minutes you’ve meditated, and your total sessions used in the app. 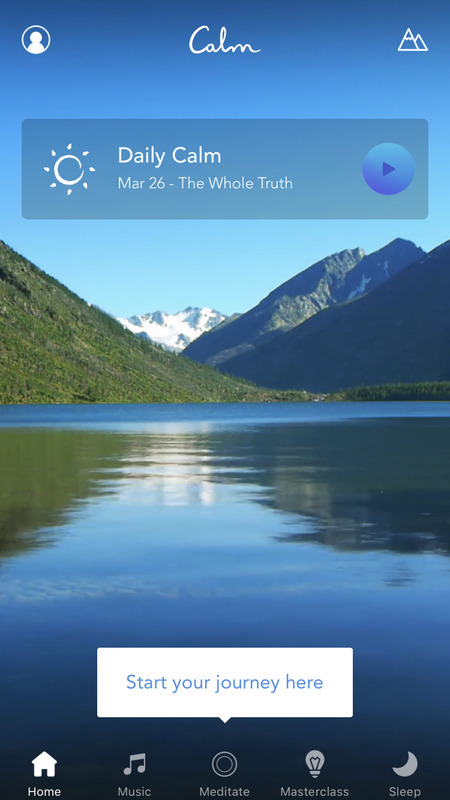 This page can also be viewed by clicking the circular profile icon in the top left corner of your home page. From the profile screen, you can scroll down to find your app settings and some share options, in case you want to brag about your new meditation routine on social media. 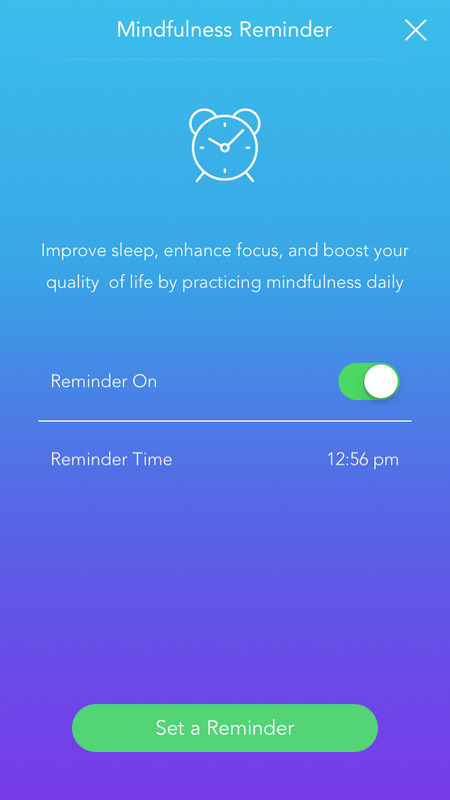 One of the most important settings for anyone looking to make a real habit of meditating is the “Mindfulness Reminder,” which allows you to set a timer for your next session. Now that we’ve mastered how to open and listen to meditations, we’ll move to the Masterclass tab, just to the right of meditations on the grey bar at the bottom of the app. Masterclasses are more informational than meditations, and are intended to teach about the various obstacles or challenges that somebody can face while pursuing mindfulness. These are more like an online class, or an informative podcast, than a meditation session. 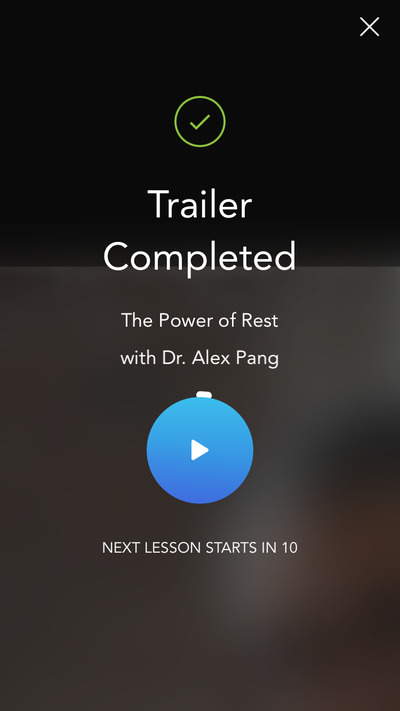 While the actual Masterclasses only feature an audio recording of the instructor over a still photo, each one comes with a short video trailer. Masterclasses also vary in length and subject matter, and look just like meditations in the app while playing. Because Masterclasses are not intended to be spaced out like meditations, they will autoplay the next class after one ends. 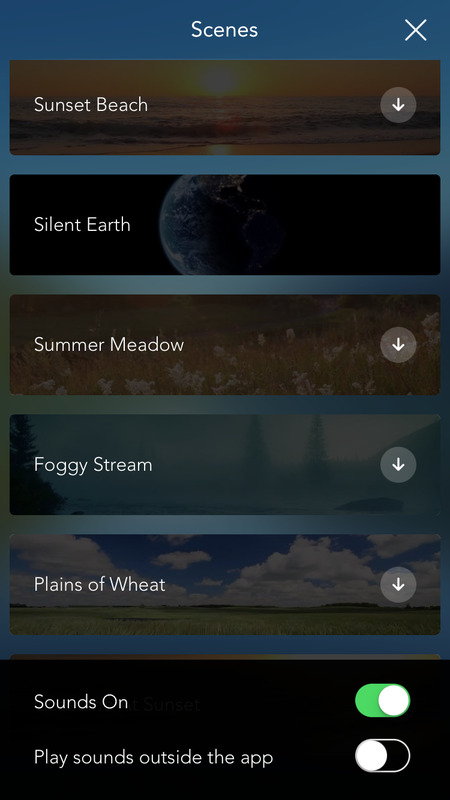 Next, let’s look at the music tab. 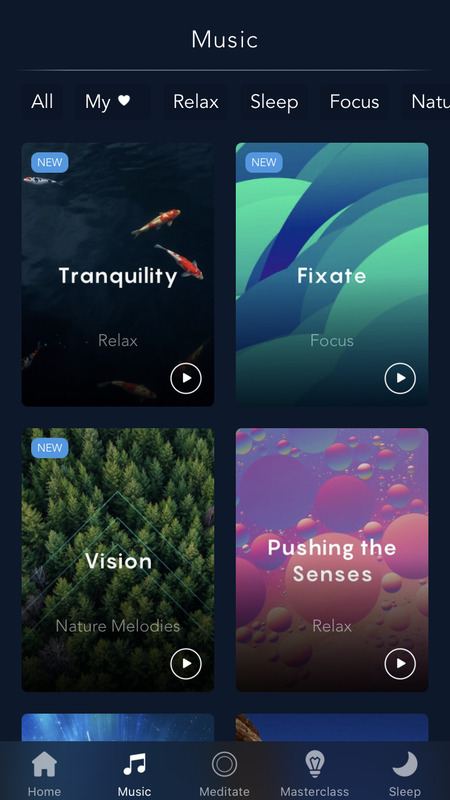 Like the meditations, there are hundreds of choices for calming music selections, all sorted and categorized by what you hope to get out of the listening experience. 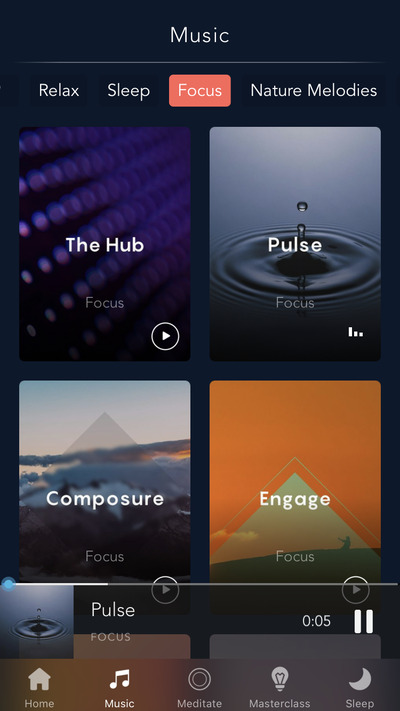 Unlike meditations and Masterclasses, the music player can minimise to the bottom of the screen, so that you can surf the rest of the app while songs play. 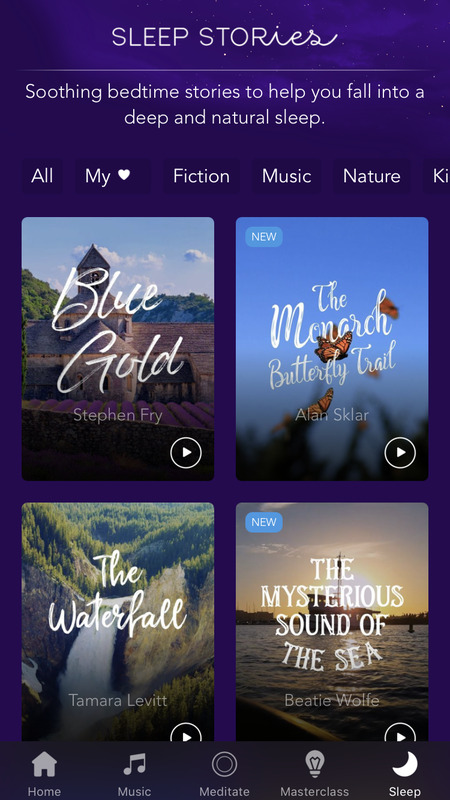 Finally, we have a massive collection of short bedtime stories, read by extra soothing and slow narrators. 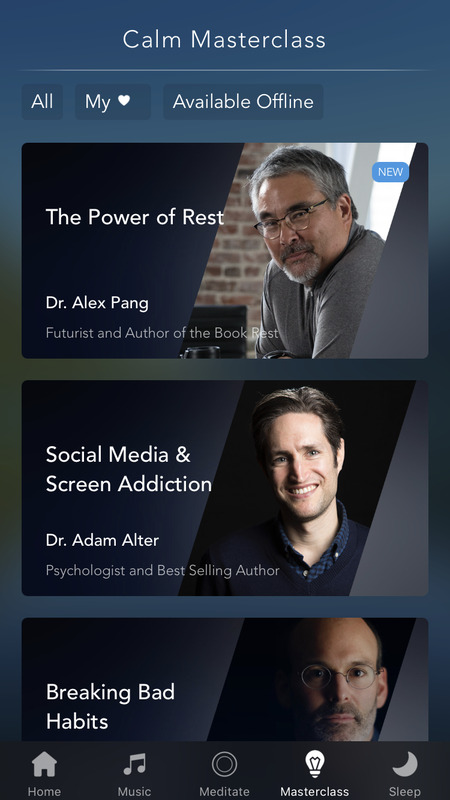 Most of the “Sleep Stories” are just that: stories, rather than meditations. 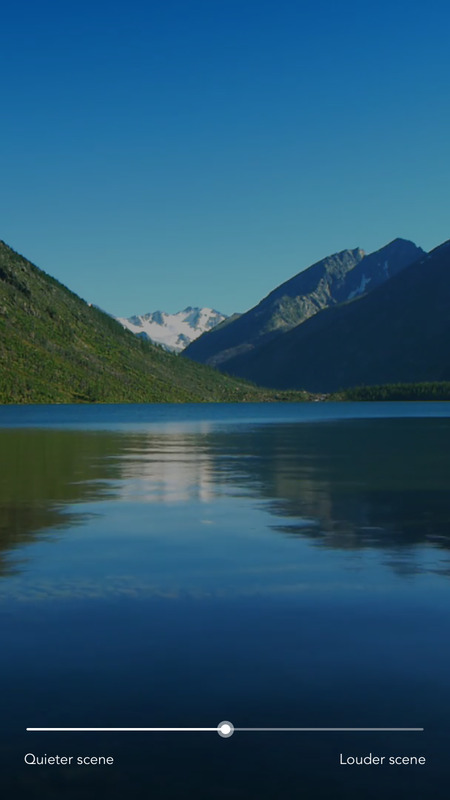 The narrators describe nature scenes, far-off lands, and grand adventures.